Pesto is one of those things which is absolutely always worth making yourself because it tastes so much fresher and it’s incredibly easy. I mean really, really easy. Made in five minutes easy. “Cooking” is a bit of a misnomer, because all you need to do is bung it all in the blender and whizz it until it’s the consistency you want. Ta dah! I think it’s even nicer the next day when the ingredients have had the chance to get to know each other. It’ll keep in the fridge for a few days (but not much longer). I agree, homemade pesto is fantastic. I love making pesto, the smell is fantastic. I always thought it was spelt parmEsan though. I think you might be right re: the spelling. I was going by Parma, the place. I think you forgot the garlic.My boyfriends an italian and we make it at home all the time, believe me without the garlic it won’t have that kick.. Recipe is this not like. Put together and blended. as shown as a picture. Sorry, but I come from Liguria where it originates. You need 60grammes of basil leaves per 100ml of olive oil. Don,t use Spanish or Greek olive oil, it is too heavy. Wash the basil leaves (grow your own it,it,s easy and much cheaper than all the imported stuff from Israel and you can avoid all the pesticides they put on it) dry carefully, avoid bruising,moisture oxidises and gives a metallic taste. Whiz the olive oil pine nuts (don,t use old nuts, they have a rancid flavour, if you lightly toast, not brown them, it takes some of the rawness away) and basil in batches with a very finely chopped clove of garlic or two if you prefer a stronger taste. Mix 60gr of Parmigiani Reggiano with 20gr of Pecorino (don,t buy ready grated it is usually stale and has added cheese crust to pad the weight). NEVER whiz the cheese with the mixture it changes the consistency of the cheese to glue!! Add with a spoon and stir carefully,add salt and pepper to taste. If you store in the fridge make sure you cover the surface with oil, as again it will oxidise. However. it freezes perfectly well. 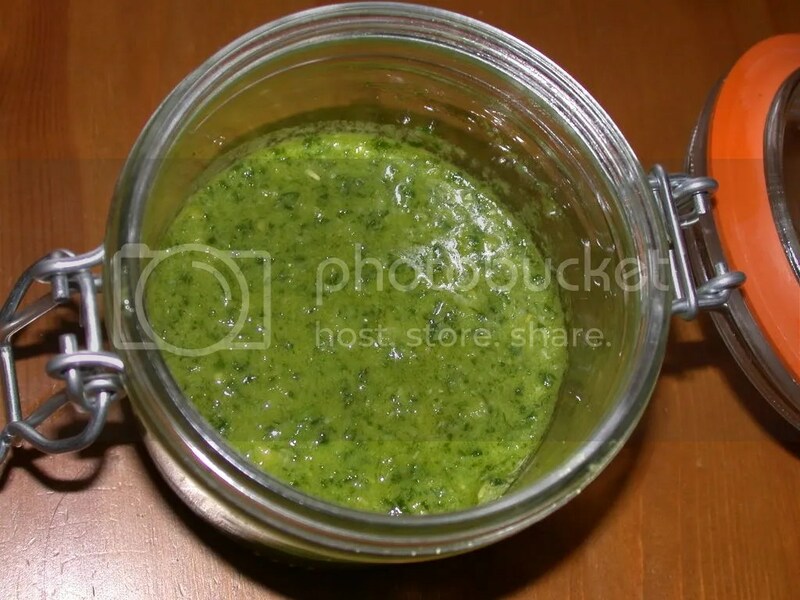 When you use the pesto ,don’t be tempted to microwave if frozen ,or warm up if not, this ‘cooks’ it which diminishes the flavour and changes the structure of the cheese. Allow to defrost naturally, this is an ‘uncooked sauce’,it is warmed by the pasta. If the pesto is too thick add some of the pasta water then add to the pasta itself. (tagliatelle ,particularly good)! If you return the pasta to the pot add a good glug of olive oil before adding the pesto as this will make it creamier as will knob of butter if you’re not worried about the calories. Don’t forget a good sprinkling of Parmigiano and a grind of pepper.